"We are the last of those who gave you breath and form, millions of years ago. We are the last of those your kind defied and ruthlessly destroyed. We are the last Precursors. And now we are legion." The Precursors were an advanced race that preceded and were mythologized by the Forerunners. The Forerunners classified them as "Transsentient" beings, having the ability to travel among galaxies and accelerate the evolution of intelligent life. While the Precursors themselves had long since disappeared during the time of the Forerunners, evidence of their technological and architectural achievements remained scattered across not only the galaxy but also outside it, namely in the Large Magellanic Cloud. The Forerunners knew few concrete details about the Precursors, and most of their supposed knowledge came from the mythology they had constructed around their creators. Their most central belief was that the Mantle (the role of guardianship of the galaxy and of all life) was bestowed upon them by the Precursors. From a Forerunner perspective, the passing of the Mantle secured the Precursors' legacy in the form of the Forerunners, continuing their work after they departed, much in the same way humanity was appointed to be the Forerunners' inheritors shortly before the activation of the Halo Array. According to Forerunner belief, the Precursors had peacefully passed away after they fulfilled their mission in creating the Forerunners. The Forerunners believed the Precursors had shaped the Forerunners in their own image, and some even suggested that they may have done the same with humans. By the time of the human-Forerunner wars, prehistoric humans also claimed to be the sole inheritors of the Mantle, something contemporary Forerunners considered heretical. The majority of this information was mythology with a dubious historical basis, providing a set of explanations for the innumerable mysteries surrounding the Precursors. The facts were very different from what the Forerunners had ultimately chosen to believe. "The Gravemind no more understands the whole truth than we do. It is past all our understanding, from the greatest to the smallest." The Precursors originated outside the Milky Way and arrived in the galaxy billions of years ago. They were an incredibly advanced race of beings who explored many galaxies and seeded them with life over the course of many billions of years as part of a grand experiment. As transsentient beings, they existed on a level beyond that of conventionally sapient biological organisms; they were described as "dreamers and makers whose minds transcended many realms and having infinite forms, many voices, and singular purpose". The Precursors were not tied to any particular physical form, assuming any shape as they saw fit; they would allow themselves to die away and be evolved anew over and over again, taking on numerous incarnations both physical and immaterial. They lived through different stages of technological and cultural development countless times, being at times hyper-advanced and spacefaring and at others living primitively and remaining confined to their worlds. The Precursors based their existence around the philosophical concepts of the Mantle, Living Time, and a meta-technological mechanism known as neural physics, which enabled them to manipulate the fabric of the universe. According to the philosophical aspect of neural physics, the universe itself is a living entity, though vastly different in nature and scale from organic beings. The Precursors' stewardship for all life involved the belief that all experience of biological organisms enriched the greater, universal whole, something they experienced firsthand through the constantly changing nature of their own existence. To contain their vast knowledge and experience the Precursors created the Domain, a transcendent quantum reservoir of information later accessed by the Forerunners. The Precursors were not strictly benevolent, considering strife, pain and indeed evil an inherent part of the universe. The struggles of good and evil, the pleasures and pains of life, added to the 'sweetness', a sensation or emotional state that seemed to not have a human-analogue. The Precursors were responsible for seeding the Milky Way with life, creating the galaxy's diverse composition of species to become "new tools and companions", and engineered millions of solar systems. Over time, they would also judge whether a species was worthy of the Mantle, their assumed role of guardianship of all life. The humanoid species native to the world of Ghibalb, who would come to be known as the Forerunners, were next chosen for this task. Originally created by the Precursors to serve as their assistants and adjutants, the Forerunner were eventually judged to be unworthy of taking on the Mantle and the Precursors instead decided that the responsibility would fall on the shoulders of another of their creations; a collection of species referred to as humanity, hailing from the planet known as Erde-Tyrene. When the Precursors announced their decision to the Forerunners around 10,000,000 BCE, the latter furiously retaliated against their creators and drove them to near-extinction, first in the Milky Way and eventually in the satellite galaxy of Path Kethona; only a small number managed to escape the Forerunners' campaign of extermination. According to the Precursors themselves the Forerunners struck against their creators unprovoked, while certain Forerunners who learned the truth later on insisted that the Precursors had planned to wipe out the Forerunners first. "We are the Flood. There is no difference. Until all space and time are rolled up and life is crushed in the folds... no end to grief, war or pain. In a hundred and one thousand centuries... unity again, and wisdom. Until then - sweetness." A few Precursors escaped or were spared by the Forerunners. They either went into suspended animation or became molecular dust that was meant to eventually regenerate into their past forms. However, over millions of years, the dust became defective, failing to reconstitute the Precursors and instead inducing madness and mutations in lifeforms that came in contact with it. This form would later be known as the Flood. Far from accepting failure and extinction, the Precursors viewed the Flood as a means to bring unity to the galaxy as well as punish the Forerunners for their insolence. Vowing that none of their creations would rise against them again, the Precursors decided that all life would be deprived of free will and merged into one; in the end, the sum of the Precursors' creation would be a reflection of themselves and the suffering their creations caused them. The Primordial and Mendicant Bias. Around 107,445 BCE, ten million years after the Forerunners' genocide of the Precursors, humanity's interstellar empire came into contact with the Precursor powder which would, over several centuries, bring forth the Flood. The Flood initially ravaged humanity's colonies until receding from the galaxy on its own accord, awaiting for a better moment to exact their final vengeance on the Forerunners. The Flood intentionally allowed some humans to go uninfected, leaving the implication of a possible cure that would misdirect efforts in its next assault, while the truth of the humans' genetic attack on the Flood was lost until it was far too late. Around the same time, a human exploratory group led by Yprin Yprikushma discovered a small planetoid at the edge of the Milky Way. Hidden within it was a large stasis capsule containing an ancient being whom they later named the Primordial—in fact the last intact Precursor, mutated to survive the passage of eons. They transported the capsule and its captive to the human capital world of Charum Hakkor and found a way to communicate with the being, which claimed to be the last Precursor. When human scientists questioned the imprisoned being as to the nature of the Flood, the Primordial's response horrified the humans so deeply that many of them committed suicide. Around ten thousand years later, the IsoDidact interrogated the Primordial on Installation 07, receiving only vague responses as to the fate of the Precursors and their relationship with the Flood. Enraged, the IsoDidact then executed the being. The Primordial faced its end with calm satisfaction, stating that the Forerunners' defiance and, indeed, its own death through the artificial passing of a billion years within an accelerating chronological field, would only add up to the total "sweetness" of life's struggles while asserting its confidence that all life would still succumb to the Flood in the end. The Ur-Didact later discovered that the Gravemind retained the thoughts and memories of the Primordial; before its demise, the being had transferred its consciousness into the Flood's compound mind. However, not even the Gravemind could fully access or comprehend the wisdom the Precursors once had, flawed and fallen as it was. In the final hours of the Forerunners' war with the Flood the Gravemind sent a group of imprinted humans, including Forthencho, Lord of Admirals, to deliver a message to the Librarian, who was stranded on Erde-Tyrene. Forthencho revealed to her the truth about the Precursors and that the Domain was, in fact, the mythical Organon, which would be destroyed by the Halo Array's immediate firing. By withholding this information until the very end, when the Halos' activation could no longer be stopped, the Precursors ensured that the Forerunners would unwittingly destroy all records of their history and their cultural heritage, or "kill their own soul" as phrased by the Librarian. This was the culmination of the Precursors' insidious plan of vengeance against the Forerunners, set in motion ten thousand years earlier with the revelation of the Flood. 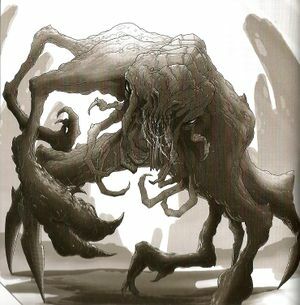 While the firing of the Halos seemingly quelled the Flood, the Precursors (through the Gravemind) had already accomplished what they intended: to punish the Forerunners for their defiance not only directly via the Flood, but also allowing the Forerunners' own scheming and internecine feuding to gradually tear down the Forerunners' deepest-held precepts and beliefs. By the time of the Halos' firing, in addition to the near-extinction of the Forerunner species, the Forerunners were forced to admit their many failures and give up the Mantle, ensuring that they would not rise again despite their Pyrrhic victory. By the modern times, any remaining Precursors have "sunk to unreachable depths". "The Flood changes everything. Not just flesh. Space itself is infected. That's the power the Precursors once had... isn't it? They shaped and moved galaxies! They created us! How did we ever manage to defeat them?" Precursor technology was extremely advanced, to the point that the Forerunners labeled it Tier 0, or "Transsentient". Precursors based their technology upon what Forerunners called neural physics: the concept that inanimate matter and thought are inextricably linked and that the universe itself is effectively a living entity. By drawing from the fundamental energies of the universe, the Precursors built exotic, virtually indestructible architecture and traveled across interstellar distances using a superluminal transit mechanism based upon the same principle. It was believed by Forerunners that the Precursors also used neural physics techniques to construct artificial planets and star systems, with Charum Hakkor believed to be one such planet. The Precursors traveled between worlds in vessels that used incredibly advanced artificial intelligence constructs known as knowledge engines and walked upon star roads. The Halo Array, being neurological weapons, are one of the only ways to destroy or otherwise damage Precursor artifacts. This was first evidenced when Charum Hakkor was used as a testbed for one of the Halos: the weapon's firing shattered every Precursor artifact on the planet. This also explains the lack of any Precursor ruins in modern society, as most, if not all, were destroyed when the Halo Array fired and sterilized the galaxy at the end of the Forerunner-Flood war. Some Precursor artifacts were known to precede the Forerunners by hundreds of millions of years and, being impervious to conventional forms of damage, were durable enough to survive being cycled inside planets' crusts by plate tectonics. Precursor artifacts were often encountered by Miners, who obtained and recorded them but rarely held any particular interest in them. The most coveted Precursor artifact among the Forerunners was known as the Organon, which was allegedly capable of activating all other Precursor artifacts. In truth, the Organon was a Precursor knowledge engine known as Abaddon, who served as the overseer and guardian of the Domain. Although incorporeal, Abaddon was capable of interacting with the physical world in various ways, even vaporizing corporeal beings at will. The Precursors also left behind a small number of mysterious deep-space artifacts known as "anchors" — large, anomalous masses which released no radiation. They were generally regarded as unstable and dangerous; the Forerunners had recorded strange phenomena near the masses, including ships vanishing and surviving crews suffering severe mental trauma, requiring extensive proto-geometric therapy to restore their minds' neural topology to its normal state. Precursor construction was gray-silver in color, much like that favored by the Forerunners. When witnessed in a collapsed state on Charum Hakkor, the construction material had shattered along crystalline planes. The Precursors also built cyclopean laboratories described as being made of "crystallized reality". Among the most impressive of the Precursors' structures were the enormous orbital arches and star roads, unbending filaments woven into the fabric of reality which were used to connect entire worlds and star systems. These structures were once plentiful in the galaxy, forming graceful curves across many star systems. They appeared to be mostly dormant and unchanging, apart from automatic adjustments based on changes in planetary orbits. Other types of Precursor constructs included structures referred to as planetary fortresses and citadels. Toward the end of the Forerunner-Flood war the Flood began to reactivate and employ these formerly inert Precursor artifacts against the Forerunners, being able to control them due to its Precursor origins. These artifacts (mainly star roads) were what eventually turned the war in the Flood's favor as they were capable of effortlessly either outright physically tearing apart Forerunner fleets or remotely deactivating their weapons, ancillas, and shields, rendering them helpless against the Flood. The Precursors' rekindled might extended beyond the mastery of technological artifacts. After reaching the Key Mind stage, Flood compound minds gained the ability to tap into neural physics and along with it the Precursors' reality-mutation capabilities. When moving across the galaxy, Flood-controlled Precursor constructs would convert space-time itself to be unsuitable for Forerunner slipspace drives due to the differences between the slipspace travel used by the Forerunners and the Precursors' neural physics-based transit. Ships using this form of superluminal travel would momentarily radiate multiversal residues accrued during the journey upon return to normal space. The Forerunners suspected that the Precursors possessed unknown means of correcting causality other than the reconciliation Forerunner ships were subject to. The widespread use of neural physics transit affected the galactic-scale magnetic fields that marked the borders of the ecumene's themas. The effects of the Precursors' manipulation of space could even be felt by individual beings; toward the end of the Forerunner-Flood war Forerunners began to perceive starlight as possessing a hostile, repelling quality. Perhaps the Precursors' most extraordinary creation was what the Forerunners knew as the Domain: a vast reserve containing the totality of the Precursors' accumulated knowledge and experience - amounting to a hundred billion years, with most of the information gathered originating from the beginning of the universe if not earlier. This reserve of knowledge was contained in Precursor constructs in the Milky Way galaxy and projected a massive field through which the records could be accessed anywhere regardless of locality. The Domain itself was also a conscious entity, although this only became apparent to most Forerunners near the end of the Forerunner-Flood war. The Domain would later be discovered and appropriated by the Forerunners as a store of their own records and knowledge, becoming a principal element of their culture. Despite this, the Domain remained highly esoteric to the Forerunners; not even its origin and true nature were known. With the activation of the Halo Array and the galaxy-wide unraveling of Precursor neural physics, the Domain and all knowledge contained therein was lost along with all Precursor architecture. While a group of surviving Forerunners later managed to reactivate the Domain, it remains unclear how much of the knowledge it once contained has been successfully recovered. The term precursor means "one that precedes and indicates the approach of another". This is also the definition of the term forerunner. The Latin root word "trans" means "across" or "beyond." "Sentience" is the ability to experience sensation, and is often used to imply sapience, the ability to think. A transsentient being may thus be considered beyond any recognized being and be on the level of godhood. The Precursors (and by extension the Flood) fill a similar narrative role to the W'rkcacnter from Bungie's Marathon trilogy. Godlike cosmic beings, the W'rkcacnter long held sway over the universe before being imprisoned by the Jjaro, the spiritual predecessors to the Forerunners. They (like the Flood) are accidentally unleashed in the setting's present day when the alien collective known as the Pfhor (a major inspiration for the Covenant) recklessly use a Jjaro superweapon against humanity. It is likewise ambiguous whether the W'rkncacnter are a single entity or an entire race with a collective consciousness. A preliminary sketch of the Primordial drawn by Greg Bear. ↑ 1.0 1.1 Bestiarum, page 26: Tier 0: Transsentient As the [Forerunners] had no examples of civilizations with technological accomplishment greater than themselves - with the exception of the Precursors - this is a theoretical ceiling. They can travel intergalactic and accelerate evolution of intelligent life. These may be creatures of legend. ↑ 30.0 30.1 Halo: Fractures, "Promises to Keep"